For the Tampa Bay Rays, every offseason is a battle between trying to improve as a team and trying to keep the team’s payroll reasonable. Like every team, the Rays have needs that they’ll look to address this winter. However, recent reports indicate that the Rays could have a potential fire sale that includes trading several of the team’s veterans. It appears that no player is off the table. At the moment, the Rays appear to be flexible in how they’ll proceed this winter. There’s no specific number for where they want their payroll to be, so there’s a chance that they’ll only make one or two trades. However, if the trade market ends up being fruitful for them after a trade or two, it’s possible that the Rays will keep dealing. As many as half a dozen veteran players could be traded, including the team’s highest paid players. One surprising name that could end up on the trading block is third baseman Evan Longoria. Longoria is signed to a long-term deal that figures to make him a Ray for life. However, he won’t have 10 and 5 rights until the middle of April, so the Rays wouldn’t need his permission to trade him if they do it this winter. Of course, the Rays would prefer to get his blessing before trading the face of the franchise. But he’s due to make $86 million over the next five seasons, so trading him could give the Rays a great deal of payroll flexibility moving forward. Closer Alex Colome is another player who could end up being traded. In fact, he may be the most likely player to be dealt. Outside of Wade Davis and Greg Holland, the free-agent market is lacking frontline closers. Once those two come off the board, Colome could become a wanted commodity. He’s only in his first year of arbitration, so his salary isn’t that high yet. But with three years of team control, he could give the Rays an impressive return in a trade. 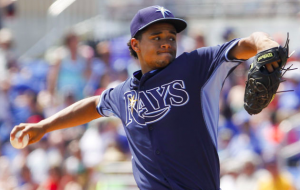 Chris Archer is another marquee name to watch. His name has been in the rumor mill before, including last summer. Archer is on a team-friendly contract, especially considering the productivity he brings to the table. The Rays will have a high price for him in a trade. But they won’t hesitate to trade him if there’s a team out there willing to meet their asking price. If the Rays were to trade players like Longoria, Colome, or Archer, it would indicate that the Rays are open to a fire sale. Trading one of those players would make it difficult for the Rays to compete in 2018. Knowing that could push the Rays into a full-scale rebuilding effort. Of course, it’s important to keep in mind that nothing is set in stone for the Rays. It’s possible that one or two trades of players like Jake Odorizzi, Wilson Ramos, Corey Dickerson, and others could be enough to satisfy their payroll needs while also keeping them in a position to compete in 2018. That being said, it’s almost a guarantee that the Rays will make trades this offseason, and it’s possible those trades will involve some of the team’s marquee players.